"Civis Analytics helps you really get to know people. 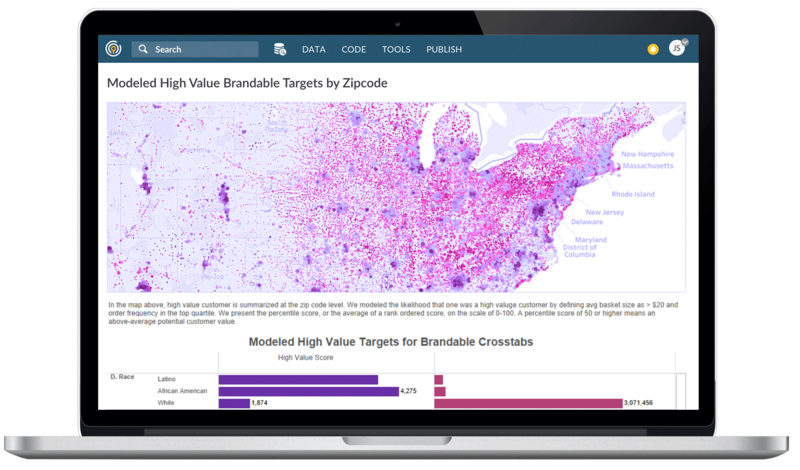 Civis is the platform to beat for data scientists who want a notebook-based platform to work with person-level data." The Forrester Wave™: Notebook-Based Predictive Analytics And Machine Learning Solutions, Q3 2018. Civis technology helps organizations use their person-level data to make smarter, faster decisions that drive real results. Our technology and services allow you to identify who you need to connect with, where to allocate your resources and how to measure success. Our products sit on top of the Civis Platform and close the loop on the most common business issues — customer data management, survey infrastructure, targeting activation, and media attribution. Our cloud-based Platform enhances speed and collaboration, so data science teams can build and deliver tools faster, and present their findings in a way that everyone can understand. We know every business has unique challenges. No matter how mature your data science function is, our Applied Data Science team can help solve your toughest statistical problems. At Civis, we take a science-first approach to solving business problems using person-level data. With a blend of proprietary technology and advisory services, we empower public and private sector organizations to identify, understand, and engage new audiences, and leverage those insights to make smarter business decisions. We partner with Fortune 500 companies and prominent nonprofits to answer pressing questions, empower data science teams with software and datasets, and help bring about fundamental improvements in how they use data to achieve impressive results.